It’s no secret that getting from point A to point B in the middle of a Canadian blizzard can be tough, to say the least. Thankfully, there’s one simple step you can take towards a smoother, safer — and even cheaper — winter drive: installing a set of quality winter tires. As the temperature drops, all-season and summer tires can stiffen and start losing their elasticity, which can lead to decreased traction and poor performance. The rubber used in winter tires, on the other hand, is designed to stay flexible even in extremely chilly weather, so you’ll get a better grip on that slippery side street. Are winter tires good for driving on ice and slush? 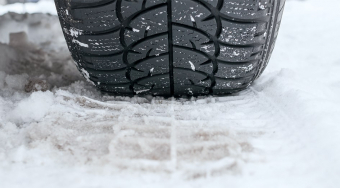 Although they’re often referred to as “snow tires,” winter tires are designed with much more than snow in mind — in fact, they provide noticeably better traction for driving in wet, icy, and slushy conditions. According to the Tire and Rubber Association of Canada, modern winter tires offer up to 50% or more traction than all-season tires, which can mean the difference between a close call and a fender bender. Are winter tires required by law? If you live in Quebec, you may be wondering why anyone would consider not installing winter tires. That’s because Quebec is the only province that legally requires every passenger vehicle to have winter tires between December 15 and March 15. Some mountainous areas in British Columbia also require winter tires. Each province has its own laws regarding the use of winter tires, studded tires, and other traction devices like tire chains — and some municipalities even have their own laws that differ from the provincial ones. Be sure to check winter tire laws on your local and provincial government websites before hitting the road this winter. How do you get the most out of your winter tires? Don’t mix and match. Mixing tires with different tread patterns, constructions, or sizes can make your vehicle less stable, so it should be avoided whenever possible — especially when you’re planning to drive in harsh winter conditions. For greater stability and control, Transport Canada recommends installing a complete set of four matching winter tires. Look for the three-peaked mountain and snowflake symbol (also known as the Alpine symbol). Tires that display this symbol meet specific snow traction performance requirements and have been designed for use in severe snow conditions. Install your winter tires nice and early. It’s best to install your winter tires before the temperature dips below 7°C, since that’s when summer and all-season tires begin to lose their elasticity. Keep your cool. While winter tires are proven to make for a safer drive, it’s still important to drive with extra caution in the winter. In cold and slippery driving conditions, it takes all vehicles longer to stop, no matter what kind of tires they have — so always leave a little extra space between your car and the one in front of you, and look far ahead as you drive so you have enough time to respond to oncoming hazards. Go deep. The deeper your tread depth, the better traction you’ll have. According to the Ontario Ministry of Transportation, studies show that tires with at least 3mm of tread depth can make your stopping distance on wet pavement 25% shorter than tires with 1.5mm of tread depth. Keep an eye on your tread wear indicators and replace your tires before their tread depth reaches the minimum requirement in your province. Avoid over-inflation. Overinflating your tires puts pressure on the centre portion of the tread, causing quicker wear and reduced traction. Plus, overinflated tires don’t cover as much ground, which decreases their grip on the road. Check your vehicle’s owner’s manual to find out the recommended tire pressure for your car. Winter tires don’t just make winter driving safer and easier, but they can make it cheaper, too. In Ontario, car insurance providers are required by law to offer a discount to customers who use winter (and all-weather) tires with the three-peaked mountain and snowflake symbol — and only time will tell if other provinces will follow suit. Talk to your broker to find out if you qualify for a winter tire discount. The information in this post was provided by our partners at Economical Insurance.